Lawn weeds are classified in three major categories, which include grassy weeds, grass-like weeds and broadleaf weeds. Lawn weeds that look like wheat are likely part of the grass family of plants, due to their specific growth habit and appearance. Only a few of the most common lawn weeds resemble wheat. Yellow foxtail (Setaria glauca) is a warm-season annual lawn weed that belongs to the grass family and grows most often in moist, fertile lawns. Foxtail grass has flattened stems that are reddish and branch at the base. Reaching a height of up to 4 feet, foxtail grass has smooth, flat leaves that are 2 to 12 inches long and ½-inch wide or narrower. The leaves often have rough edges and 1/8-inch twisted or spiral hairs near the leaf base on the upper surfaces. Yellow foxtail grass resembles wheat usually from June to September, when the weed bears 2- to 5-inch cylindrical, bristly and erect yellow seed heads. You can get rid of foxtail grass by applying a pre-emergent herbicide one or two weeks before the seeds germinate in late spring or early summer, or by applying a post-emergent herbicide after the seedlings emerge but the weed plants are still small. Quackgrass (Agropyon repens) is a cool-season perennial weed of the grass family that usually appears in thin, dry lawns with well-draining and slightly acidic soils. Quackgrass can grow up to 4 feet tall and spreads by seeds and underground fibrous rhizomes. The stems are smooth with some short hairs. Quackgrass has flat, rough-edged leaf blades that are dull-green to light bluish-green, 3 to 12 inches long and 1/8- to ½-inches wide, and rough or hairy on the upper surfaces with smoother or slightly hairy undersides. Quackgrass’s wheat-like flower spikes are narrow, 2 to 6 inches and dense. The flower spikes emerge from May to September. Control quackgrass in your lawn by fertilizing and irrigating the turfgrass to improve density, mowing lower, and applying a non-selective herbicide when the quackgrass weeds are actively growing. Barnyard grass (Echinochloa crus-galli) most resembles wheat in its thick stems that can grow up to 5 feet tall and its panicle seed heads that grow 4 to 16 inches long. The terminal panicles are made up of spikelets and are green to purplish in color. Barnyard grass is a summer annual weed has smooth, hairless stems that grow erect and branch at the lower part of the plant, often slightly reddish or maroon in color at the base. The leaf blades are rolled inward at the shoot and are 4 to 20 inches long with prominent white mid-veins. 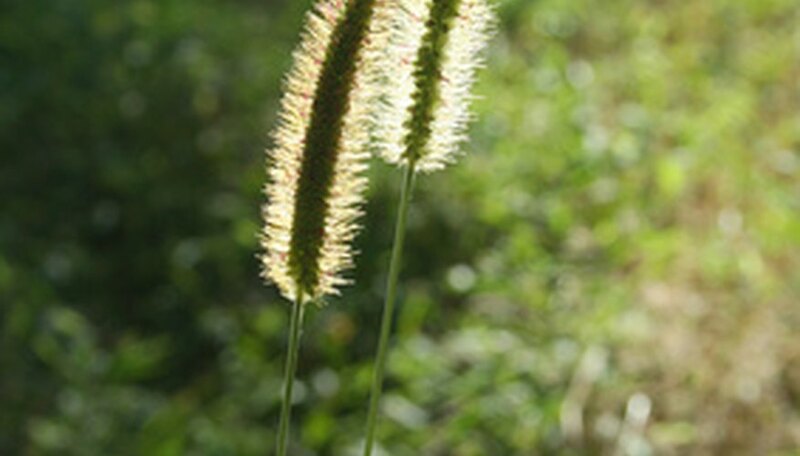 You can get rid of barnyard grass in the same manner as yellow foxtail grass. Regular close mowing is also an effective cure for barnyard grass. Annual ryegrass (Lolium multiflorum) is a cool-season or winter annual lawn weed that grows up to 3 feet tall with distinctive, 4- to 16-inch seed head spikes. The leaves are rolled inward at the bud with glossy undersides. The leaf blades are 2 ½ to 8 inches long and the stems at the leaf sheaths are reddish at the bases. Perennial ryegrass (L. perenne) is nearly identical in appearance, but it doesn’t have the red-tinted stem bases like annual ryegrass. Ryegrasses often resemble wheat due to their seed heads, which are not as dense as quackgrass seed heads, but instead have spaced spikelets arranged alternately up the stems. Control methods for ryegrasses are the same as barnyard grass and quackgrass.